How is our Love Mercy partnership making a difference? At Wavelength, one of our core values is making a difference. Over the holidays, in lieu of gifts to our candidates and clients, we donated an amount to the Love Mercy Foundation that enabled the complete operation of their Kristina Health Centre in Uganda for a month, covering all staff salaries and medical supplies. We love partnering with Love Mercy as they provide such complete detail about the difference our contributions are making. Read below for an example of how our recent donation made an impact. This is a day-in-the-life of one of the Love Mercy Kristina Health Centre midwives. Anyess Aceng (prounced An-yes A-cheng) is a 26-year-old midwife who has recently returned to work at the Kristina Health Centre after giving birth to her first baby three months ago. She is from a town called Dokolo, but lives on site in the staff accommodation with her baby Shalon and her babysitter. Her baby is minded nearby and brought to her to breastfeed throughout the day as needed. Anyess’ husband comes from Alebtong and is a high school teacher. Anyess began working at the health centre in July 2016, when the maternity service commenced. 8:00am: Anyess begins work at the Kristina Health Centre. Anyess’ day begins with completing paperwork required for the USAID Voucher Program that all the maternity patients are on, as well as reviewing any overnight births. Anyess tallies up the costs associated with the care for each patient. 9:30 - 10am: Patients start arriving at the clinic. Many women travel long distances on foot to get to the Kristina Health Centre. As the pregnant women begin to arrive, Anyess puts the paperwork aside and commences the antenatal clinic. On average it takes about 40 minutes to see each patient - listening to fetal heartrates, checking for maternal malnutrition, blood pressure checks, assessing the size of the baby to come, encouraging the women to return for future antenatal checks. A lot of women have multiple health or pregnancy issues such as malaria (common in the area), being generally unwell or possibly having twins. Many women are either young first-time mothers at the age of 15, 16 or 17 years old or older, and having their 6th, 10th or 12th child. All patients are tested for HIV, syphilis and urinary tract infections. Their partners are also tested for HIV if they attend the clinic with their wife. A lot of time is spent on discussing contraception options and the health risks associated with having many children. Contraception services are also provided at the Kristina Health Centre. The antenatal clinic runs until lunchtime (but often Anyess works through lunch so the pregnant women can get home for their own lunch). Lunch at Kristina Health Centre is provided for staff - poshu (pronounced po-shoe, a starchy boiled vegetable) and red or black beans. Often women arrive in the afternoon saying their labour pains commenced that morning. Anyess balances her time between the remaining women awaiting antenatal treatment and the new labouring women. Once the antenatal clinic is finished, Anyess focuses all of her time on those in labour. She provides advice and ensures the patient drinks the hot sweetened black tea that is favoured by pregnant women in Uganda. She assesses the woman’s progress and encourages them to walk around. The patient's support person brings food to cook on the small compacted dirt stoves in the patient kitchen to prepare meals. Anyess prepares the labour room, ensuring the patient’s support person has blankets for the expected baby and brings the soon-to-be mother into the labour room. She then encourages the woman throughout labour, and once the baby is born, the umbilical cord is cut and the baby is wrapped up in blankets keeping them warm and dry. Tetracycline cream is placed on the baby’s eyes to prevent infection and they are given a Vitamin K injection. All women breastfeed their babies as formula is too expensive and not available in the village. Anyess ensures the new mother’s baby feeds easily. Once the newborn is ensured to be healthy and feeding, Anyess cleans the room and sterilises all the equipment to prepare the labour room for the next birth. Anyess falls into bed after feeding her own baby one last time for the day. Sometimes she’ll have to wake up and conduct a birth overnight, then start the process again the next morning. 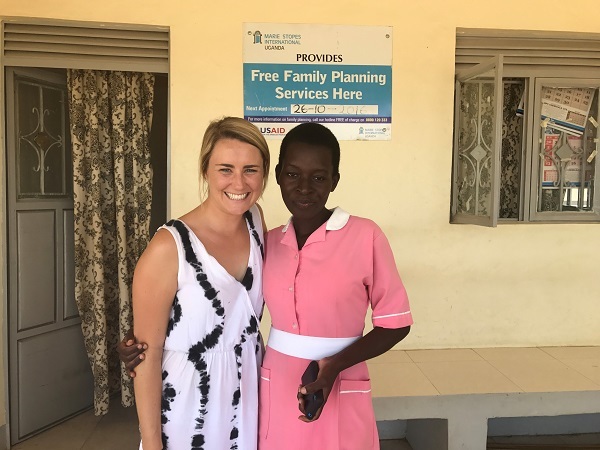 Currently, at the Kristina Health Centre, there are two midwives and they work alongside each other, reducing the wait time for patients in the antenatal clinic. In 2018 Love Mercy hope to raise enough funds to build a complete maternity ward at the Kristina Health Centre.